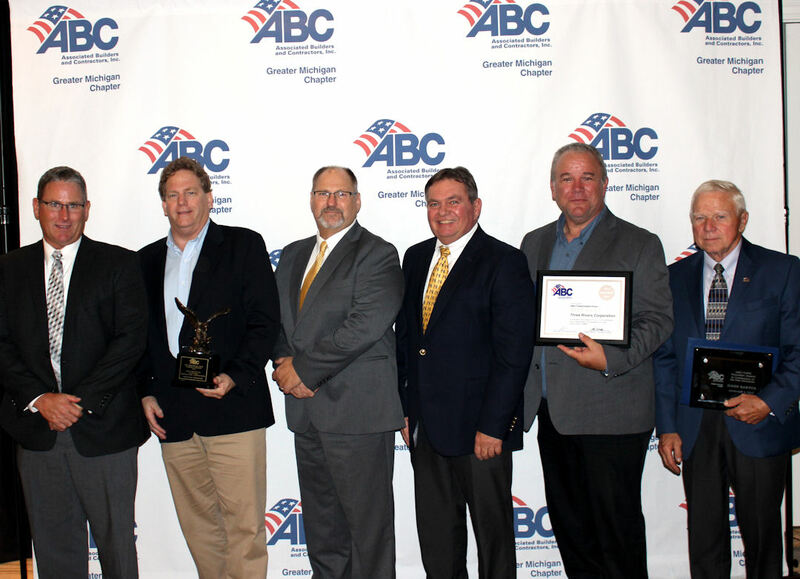 Three Rivers Corporation received a 2016 Excellence in Construction Awards and a Platinum Safety Training & Evaluation Process (STEP) Award from the ABC Greater Michigan Chapter at the Greatness & Gratitude Awards Celebration on Thursday, September 8th. The ABC Excellence in Construction Award seeks to recognize the entire construction team – construction owners, designers, and contractors–working in collaboration to successfully complete a project on-time, with exceptional quality, and in a cost-effective manner. Entries were submitted by providing a project narrative and detailed description of the construction process used with specific attention to new processes, time, and space restrictions, and special challenges faced to complete the project. Three Rivers was honored for their design and construction of MidMichigan Health’s Gerstacker Building in the GC/CM New Construction over $10 Million category. At a local level, this recognizes and promotes quality workmanship by our very own merit shop contractors and their employees. The Safety Training and Evaluation Process (STEP) Award, recognizes the efforts of ABC members that strive to achieve effective safety practices within their companies; the organized approach for analyzing and developing safety and loss prevention programs. Additionally, Three Rivers provides contractors with a tool to objectively evaluate their safety programs, policies, procedures and training. For firms exhibiting the highest level of dedication to safety, special Platinum recognition was presented. Firms receiving the STEP Platinum Award are featured in national publications and are eligible to receive the ABC National Safety of Excellence Award and will be considered for the industry-wide awards. John Bartos, the founder of Three Rivers Corporation, received the Founders Award. This award is given annually to an individual that best exemplifies the philosophy of The Association of Builders and Contractors over a period of time in the advocacy of both Merit Shop and Workforce Training. John has dedicated his time with ABC for over 40 years.